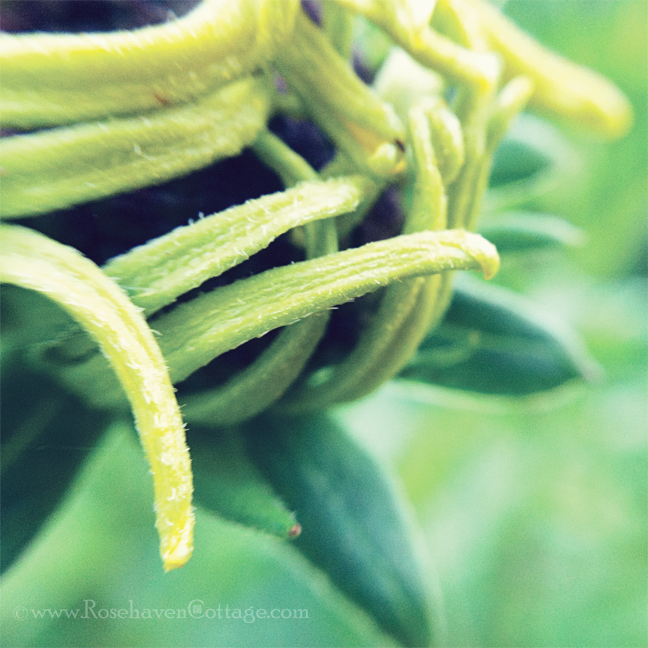 Rosehaven Cottage: Early blooming rudbeckia... why couldn't I have been like you? 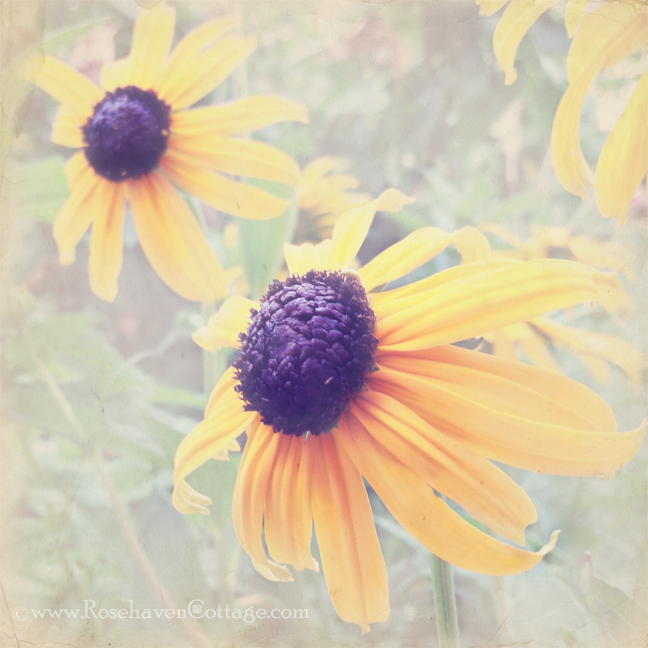 Early blooming rudbeckia... why couldn't I have been like you? A patch of rudbeckia blooms early this year--probably because it overwintered quite well and didn't have to play catch up. How I wish I didn't always feel like I was always playing catch up. I listen to podcasts of accomplished creative twenty-somethings. I often find myself thinking, "Why couldn't I have been that together at that age? Why couldn't I see what I really wanted... no, needed to be?" A reluctant late-bloomer, I feel so behind. Self-talk riddled with "should have's" clogs my thoughts. Hubby says I'm "should-ing" all over myself. He's right. I know it. Yet I can only make the "should-ing" go away for short periods of time before it's back jamming up my creative senses to the point where I can't hear anything but their clamor. Eight years ago, it was photography that pulled me from the dark abyss I had entered when I abandoned all creative and artistic pursuits and swore I wouldn't try again. After 10 years of trying to "make it", I had been rejected by so many gatekeepers and curators of the world of creative professionals that I couldn't do it anymore. I had determined I was not talented enough or educated enough to rub shoulders with those that called themselves "professional artists". I figured I had missed the boat by not getting my act together in my early twenties. I concluded it was my own stupid fault and, despite the ache inside, I had to accept this self-imposed sentence. I was bruised and my dreams had been crushed so many times, I decided to quash them altogether. But eight years ago, walking along a beach on the north shore of Oahu with a little Sony Cybershot digital camera in my hand, I let my photographic passion come out to play. The place (one I consider to be a personal safe haven), the moment and nature combined forces and reached out to the part of me locked deep inside--so deep I thought it wasn't there anymore. There was enough of a spark to start a small flame, and as I allowed myself to fan the flame it grew progressively brighter as the months passed. In the years since then, I've often thought that photography was just the entry point to get me back on the creative track. But maybe I'm wrong... maybe photography is my destination and not a stop along the journey. Maybe that is why when the "should-ing" in my head becomes overwhelming, I retreat to photography and not drawing or painting. When I look at it that way, then I don't feel so far behind. I don't feel like such a late bloomer. I don't feel out of step or weighed down with thoughts of, "You should have done something long before now..."
Why? I don't know. It just is. And photography takes me there. I think we all, if we'll admit it, feel the awful weight of comparison. It's something I struggle with, too, and the most damaging result is the paralysis it brings. Cindy, I read this yesterday and so many thoughts went through my head that I closed the post, and thought I would comment today. There are so many differences now between when we were in our 20's and the amazing technology and formats that are available today. Times change, for the good I hope, but maybe your time is now, not before...maybe despite everything you thought, you are now more ready then before...I think many of us are poised...we will jump, and we will swim. How far, I have no idea...but we will swim. When I was in art school it seemed so easy...the hard part was getting out into the real world, and making a living seemed to take precedence over art...I've seen it in so many of my generation. But somehow we are all meant to come back to our art, maybe even in a different form...I used to be a watercolorist...now I am headed towards photography. It does seem like all a trendy 20 something person has to do is start a blog and watch it grow to massive readership..it's the times. And how wonderful that is. But this time is yours, lets not compare ourselves to others...but to move forward and do our best. I look at the 2-somethings among my nieces' children, then chatting at lunch to my sister's friends. We had a different sort of life in our twenties, the past is a different country. I felt like you and then I took my camera out. Took pictures. I love what I took. I looked at other crafts and said to my hubby I wish I could do that Mini book.I had a real off the dooer craft lady tell me you can do it. She even sent me a mini book and told me to make inside and my own. So far I am in shock as to me it is my encourageent book. She even shared with me how she felt when she stepped out. After doing like 13 or more scraping books and designing my cover self to my liking. I managed to do a material page book for my best friends Mom for her 93th Birthday. I posted it up on my blog.I feel I did a great job. It is pretty . I am not feeling an old timer who has loss her get up and go. So good for you. You do what you feel inside and who cares if it is not up to par of others. It is you taking baby steps to be not shy and being brave to do something you love and different them what you went to art school for when you were young. I am 71 and I feel I am as good as the next person.I dont have to compare myself to others. God knows all about me and I have him to hold me up when I may fall in my negatvity that once in awhile pops back and forth. t compare ourselves to others. We are walking in the right direction of happiness within. Thank you for this post, read it with empathy. Visiting from Claudia's. Fantastic post and photos ! I came here via Jen at Muddy Boots Dreams ! I also have had a passion for photography for many years as well as nature , for me they go hand in hand there is nothing like capturing life and that moment and able to keep it for ever . I started my photography long before digital and something happened in my life and for 15 years I gave it up ! In the time I gave it up I knew I was missing it and longed to get back into it but life then didn't let me but now for the past 7 years I have been back into it and to this day never knew how I lived with out it ! I am no pro and do photography as a passionate love and hobby and if some one along the way see's one of my many photos and wants to buy it then I will be happy to sell it to them ! I started two blogs as a hobby as well to share my photos and the goings on in our neck of the woods and have enjoyed now 3 years of blogging . Last year hubby and I had joined up with a horse club that has many events going on and we are their photographers it is working out well and we are going to this years first event Sunday. I love it as I grew up around horses . Thanks for sharing this wonderful post with us . Have a great day ! Cindy...I came via Jen's blog and read your post twice. So many things you have said ring true with me. In my case, I should have had more dreams...I know, that sounds odd, aren't we all dreamers when we're young? Instead I let the flow of life take me on it's own journey. No regrets, other than that one thing, never having a dream. So I'm middle aged, children almost grown and I have no idea which direction I'm going. I know too well that I have to grab the reins at some point. I applaud you for the path you are on, for finding it and cultivating it. My story may not be the same but I think we have a lot in common. I look forward to following your blog! I work at school for kids who didn't go at the same pace. Some were faster than their classmates, but others couldn't keep up. Still they knew an education was important and we allow them to get a high school diploma at 24. I don't judge. Little kids don't learn to walk at the same time, talk at the same time, learn to ride a bike at the same time. Some are faster and some are slower. It doesn't make a difference as long as you get where you are going. 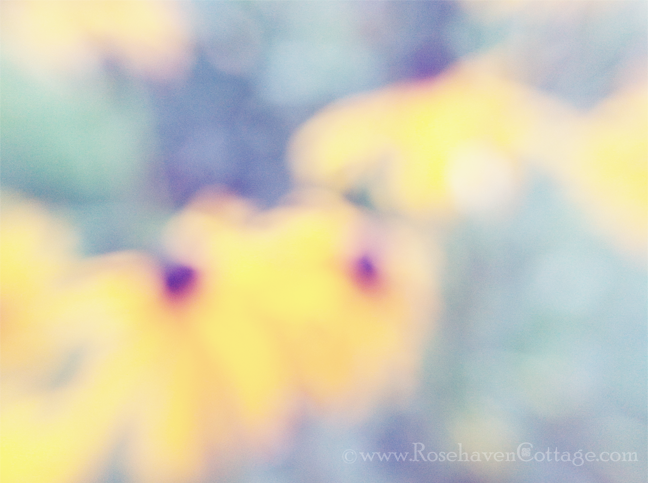 I used to draw and break horses as a kid, now I take photos, garden, and quilt. I grew I changed. I am proud of my accomplishments then and those now. I can't wait to try a new set of things in the future. I enjoyed your post (sent here by Jen). Thanks for the thoughts for me to mull and I hope you enjoyed mine. A beautiful post indeed. I'm always telling my kids that the only person they ever need compare themselves to - is themselves. I have always loved photographs, but dropped photography in college. Later in life, I have come back to it and now it is something that I can't imagine doing without. Is someone missing their contraband chicken?